From the same dynamic husband-and-wife team who brought us Hungry Planet, comes the much anticipated What I Eat. 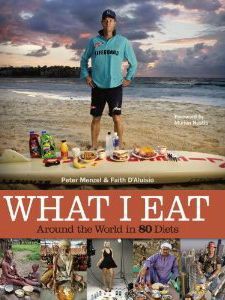 In vivd photographs and thought-provoking text, this remarkable book chronicles a three-year around-the-world journey and delivers a fascinating portrait of what individuals eat over the course of one day. With camera and notebooks in hand, Peter and Faith visited thirty countries and a dozen U.S. states to interview, shop, cook, and eat with a wide variety of individuals — from a bike messenger in Japan and a Maasai herdswoman in Kenya to a traditional baker in Iran, a model in the U.S., and a bullfighter in Spain. They even traveled out of this world, to photograph a former NFL player turned astronaut, who was photograph while orbiting the Earth with his daily meal floating around him. "You are what you eat" has never been fully visualized as it is in these photographic portraits, which feature the food and beverages (including vitamins, supplements, and cigarettes) that each person consumes in a day, plus demographic particulars such as age, occupation, activity level, height, and weight. The food is the focal point of eat profile, which details every item consumed and the total resulting calorie count. The numbers are at times expected, at other times surprising, and always fascinating.